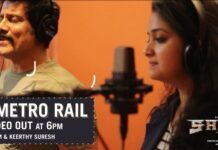 Sarkar Teaser starring Vijay and Keerthy Suresh is one of the most awaited movie of this year. Sarkar Tamil teaser starts with a voice-over of Varalaxmi Sarathkumar introducing Vijay as a corporate monster. He is known for destroying rival companies. 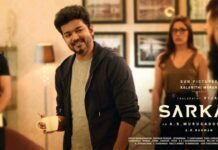 Vijay is seen saying, “I am a corporate criminal.” It looks like Varalaxmi Sarathkumar and Radha Ravi are playing ruthless politicians in this upcoming political drama Sarkar. After the blockbuster movies- Thuppakki and Kaththi, this is the third time, Actor Vijay and AR Murugadoss have teamed up for Sarkar. 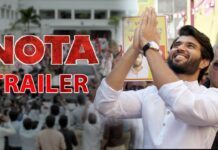 Apart from the lead pair, Sarkar has other stars like Varalaxmi Sarathkumar, Arjun Sarja, Prem Kumar, Radha Ravi and Yogi Babu in supporting roles. Sarkar Movie is slated to hit the theaters on the occasion of Diwali 2018.